The short documentary film, Pandora's Hope: Aia nô i ka nânâ `ana, reveals a side of Kauai, Hawaii, rarely seen by the millions of visitors who come seeking paradise on earth. It's an important and surprising film shining daylight on secretive corporate & government scientific research; genetic modification in agricultural and biological organisms (GMOs); growing trends in open source science; and the urgent need for transparency and ethical responsibility, not only on Kauai, but worldwide, to protect the planet and everyone on it. Should we, as citizens, be guaranteed a certain degree of self-determination and the ability to choose what we do to or put in our bodies? Visitors to Hawaii have probably never imagined the Kauai captured in the new documentary short film, Pandora's Hope: Aia nô i ka nânâ `ana (We'll see what the future brings) produced and directed by Kit Farrell. The tiny island of Kauai is reputed to be one of the most beautiful places on earth. It hosts over a million tourists each year. But there's an underbelly that most visitors never experience. This Hawaiian paradise is being torn apart by polarizing corporate, scientific, military, and environmental issues. Pandora's Hope recently screened at the Moondance International Film Festival and the New Filmmakers New York Screening Series. The next screenings will be on October 25, 2013 at the Indie Fest USA International Film Festival in Orange County, California and November 7, 2013 at the Big Apple Film Festival in New York City, New York. Screening times are below. This twenty minute film, the precursor to a feature documentary currently in production, shines a light on the issues that are dividing Kauai's residents. Huge multi-national corporations are pumping undisclosed pesticides in open-air fields for GMO research and development. Residents are fighting to protect their local seed culture and the health of their community. The military industrial complex is conducting missile and drone research in the sea and air with devastating environmental impact. And, a local alliance is funding questionable interspecies stem cell experiments. What are the current ethical and financial realities of scientific innovation, and how do they affect each of us personally regarding the food we eat, our health, and our general well-being? Does the lack of transparency of corporate and government ownership of research and product development in food, medicine and personal security pose potential hazards? On the one hand, we are literally being force-fed industrially created food with unknown long-term effects on our health and the environment. On the other hand, some of us are willing to be human guinea pigs to help find cures for medical and dental conditions, also with unknown long term effects on our health and the environment. Says Kit Farrell, director and producer of Pandora's Hope, "Should we, as citizens, be guaranteed a certain degree of self-determination and the ability to choose what we do to or put in our bodies? These are questions that inspired me to make this film." The heart of the film follows two accident victims in their search for normalcy. 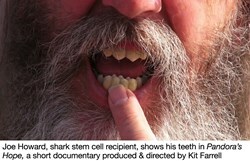 One was injured in a motorcycle accident and is the first successful recipient of shark stem cells for tooth regeneration. The other, with a spinal cord injury due to a body surfing accident, is searching for a neurological cure. Both are aligned with the Kauai Open Source Science Alliance (KOSSA), a group of philanthropists, scientists, and professionals on a mission to change how the world conducts science. Their work with shark stem cells has the potential to revolutionize the dental industry as we know it, as human beings will now be able to regenerate their own teeth. Present at the screenings and available for Q&A will be New York Director and Producer Kit Farrell along with Dr. James Croft, geneticist, and Joe Howard, Kauai resident and interspecies stem cell recipient. Both are featured in the film. View the Pandora's Hope trailer at http://pandoras-hope.com. If you are unable to attend one of the screenings and would like to see the film, you may access the screener at: http://youtu.be/QfIhiNs-VJ8 or by searching YouTube.com for Pandora's Hope Movie. To schedule an interview with Kit Farrell, contact her directly at thekitfarrell(at)gmail(dot)com or 646-652-6617.